Oakley Modular Synthesizers - Which Modules to buy? Which Modules Should I buy? The first thing that any modular builder needs is a case. This is a custom 6U high 19" rack sleeve from Flightcase Warehouse in the UK. It has front and rear rack rails fitted with a distance of 250mm between them - which is a lot less than most 19" flightcases. The case is built from black astroboard with aluminium trims and costs around 60GBP. A 19" wide case has 10U of width to play with. Most Oakley modules are 1U wide but some like the VCO are 2U. At the rear of the case you can see an Oakley PSU and Dizzy mounted on a 4U high blank 19" panel. Which modules make up a modular synthesiser? 1 VCO - this makes raw sound of the synth, analogous to the strings of a guitar. You can use either our small SVCO or larger VCO. 1 Power supply and distribution board - to power your modular. A case - to house your modules. Ready made or custom built 19" rack flightcases are the easiest to use. This is the bare minimum really and will give you a synth somewhat like a SH-101. For studio and home use you should also consider the cases from All Metal Parts in the UK as they have a good range of flat pack 19" rack (ie. 10U wide for 10 single width MOTM format modules) 5U, 6U and 10U metal cases with rack rails to the front and rear of the case. As an example their 5U high, 300mm deep case is part number AMP05007. They can also supply blank panels (eg. AMP130045) for any rear mounted power supplies and pairs of rack rails (AMP31002) for mounting your modules. Flightcase Warehouse in the UK can supply 19" rack sleeves and flightcases for a very good price. I recommend their custom service if you need a shallower case or backless case. To mount standard Oakley MOTM format modules into a 19" rack you will need a pair of either All Metal Part's AMP31002, Krisp1's 5U mounting rails or Synthcube's MOTM 19A rack mounting rails, for every 5U of height. What order should I build the modules? Once you have your case sorted your first module should be the power supply. No module can work without a power supply so it makes sense to do this part first. Do not skimp on the power supply or the distribution system. Good quality power and cabling will save lots of time later on and will ensure your modular sounds good. The Oakley PSU is good quality, easy to build and a safe option. I would recommend the next module you should get is a VCO. On its own it is not much use but the oscillator will act as a signal source for all your other modules. The third module will probably be the midiDAC to allow for keyboard control of the modules. You may already have a midi-CV convertor, or a CV/gate output synthesiser, so in this case you may not need a midiDAC. Then you should consider building a filter, an ADSR/VCA, and an LFO. This should give you a great sounding synthesiser with a huge potential on which to expand. 1 Discontinuity - our unique waveshaper and ring modulator. Create new esoteric sounds. However, everyone will have their own pathway to their ultimate synth system. Indeed, not everyone starts with VCOs and many use their modulars to process external sounds. They would start with an EFG-Deluxe and perhaps more filters and have a ring modulator. 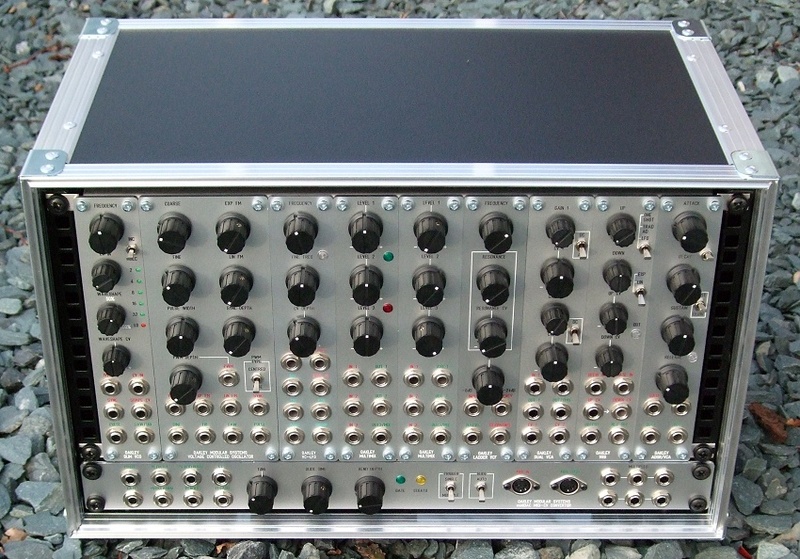 An example of a small but powerful Oakley modular system comprising of SVCO-B, VCO, VC-LFO, Multimix (x2), Transistor Superladder VCF, D-VCA, VRG and ADSR/VCA. 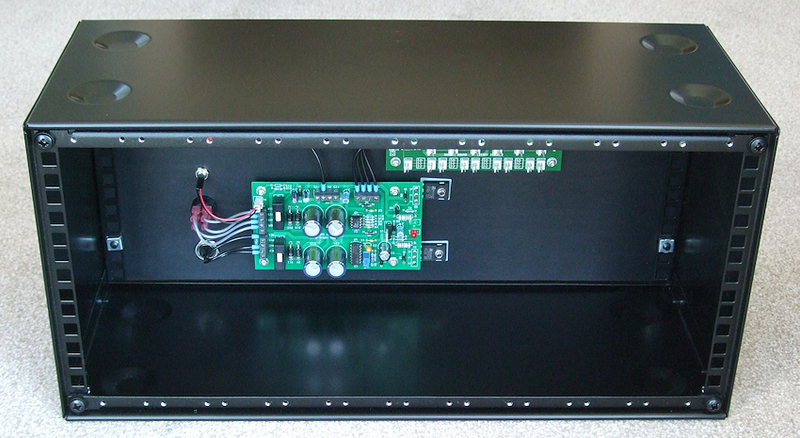 The 19" wide module underneath the 5U high modules is a midiDAC rack. Gordon Reid's Sound on Sound articles are pretty good for learning all about sound synthesis in general. Last revised: August 10, 2017.